Item # 302084 Stash Points: 13,499 (?) This is the number of points you get in The Zumiez Stash for purchasing this item. Stash points are redeemable for exclusive rewards only available to Zumiez Stash members. To redeem your points check out the rewards catalog on thestash.zumiez.com. Sleek and clean in design, the XI Realm Blue Ion Snowboard Goggles from Dragon are here to take your riding to the next level. 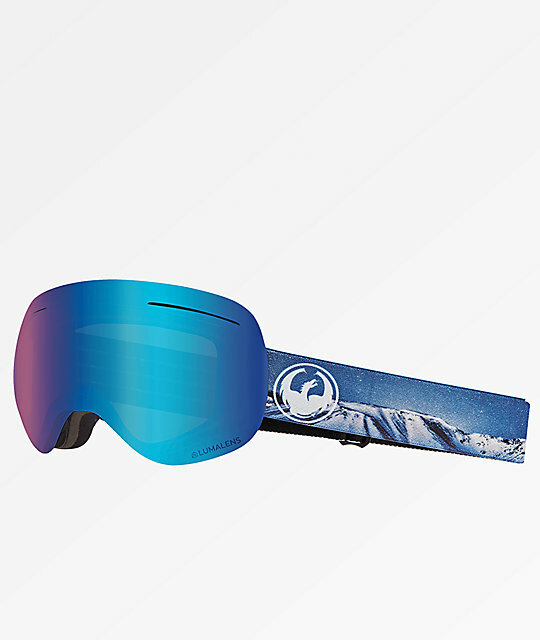 These large frame snowboard goggles come with Dragon's Blue Ion Lumalens® lens, along with a bonus amber lens, which will have you covered in most weather conditions on the mountain. Coupled with premium features like Super Anti-Fog coating, triple-layer face foam, and hypoallergenic microfleece lining, the XI Realm Blue Ion Snowboard Goggles offer unmatched performance on the hill for those who don't want their goggles to ruin their day. 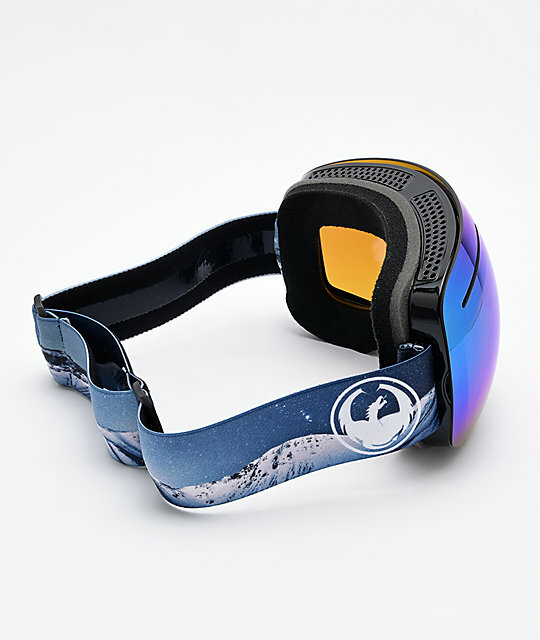 XI Realm Blue Ion Snowboard Goggles from Dragon. Durable, comfortable & featherweight patented "frameless" design maximizes field of vision. Sublimated graphics of snowy mountain scene with white Dragon logo on strap. Size: Large non-gender specific fit & design. Polyurethane construction: flexible frame material that is durable at all temperatures. Blue Ion Lumalens® lens: Dragon's exclusive full spectrum lens reduces glare and has a Visual Light Transmission (VLT) of 15%. Amber lens Included: 35% VLT for low light, partly sunny to cloudy conditions. Super Anti-fog & scratch resistant coating applied to the lens so vision remains clear even in the gnarliest conditions. Unidirectional Airflow System: provides superior airflow to prevent fogging. Dual Layer Face Foam: soft form fitting foam that molds to wearer's face, backed with hypoallergenic micro fleece layer for comfort. Adjustable 1.5" stretch strap w/ silicone grip for secure fit.